Harness the reliability of Ethernet for your USB-C device with the USB-C to Gigabit Ethernet Adapter. 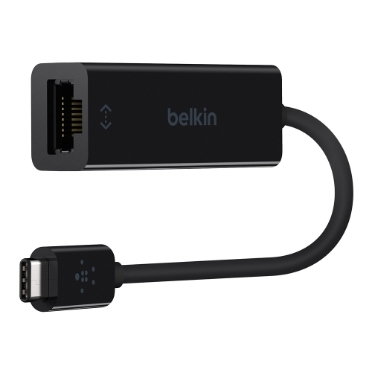 Where wireless connectivity is inconsistent, overextended, or even non-existent, this adapter allows you to connect seamlessly and with confidence. With the speed and reliability of Gigabit Ethernet, even the largest downloads can be possible without fear of interruption. A hard-wired USB-C to Gigabit Ethernet connection provides endurance and speed, wherever wireless is unreliable or inconsistent. With a proven track record in USB-C cables, this Belkin cable has been designed and tested according to our rigorous standards.